This entry was posted in Uncategorized and tagged 'animal cruelty', AWHPC, BLM, drug, endangered species, extinction, horses, HSUS, Humane Society of the United States, immunocontraceptive, Kirkpatrick, mustang. sell out, native, Pesticide, PZP, research, Salazar Plan, wild, wild horses by Protect Mustangs. Bookmark the permalink. Reading this article once again enforces my decision to no longer be a member of HSUS & withdraw any and all donations. They do not help animals and I hope the rest of the U. S. will finally cme to that realization. Especially now, The HSUS wants to forcibly sterilize our wild horses & burros! This is an unacceptable practice and must be stopped. The wild horses & burros can manage their own hers without any help from so called animal advocates like the HSUS. 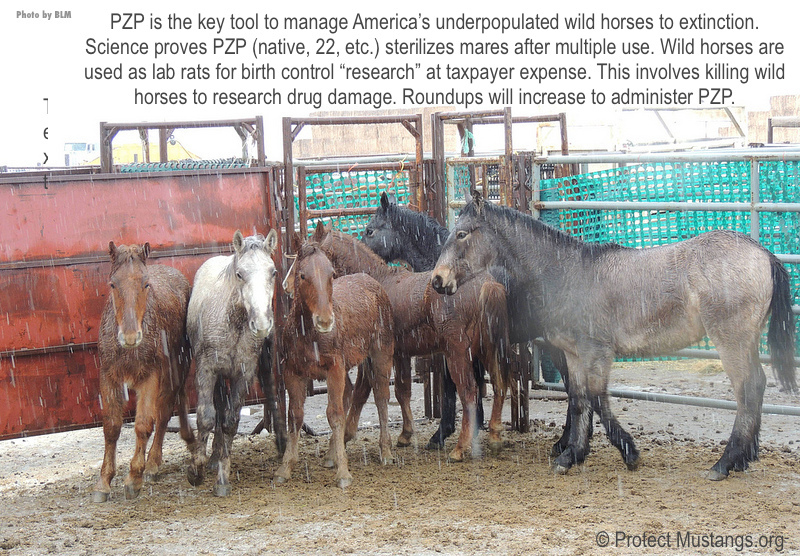 The act of using Wild Horses to experiment with drugs of any kind is abusive and against Federal Law! PZP is one of those drugs. The HSUS in carrying the patent for this drug must bear the responsibility of the induced side effects that will assuredly become evident as time passes. The responsibility will also be on the consciouses of the BLM, Mr. Kirkpatrick, and a host of others that continue to hoodwink hundreds of advocates, sanctuaries, and United States citizens general public of PZP’s use on Wild Horses. Wayne Pacelle WTH do you think you are doing? First you help sick vick get another dog, another pit bull none the less. Having any animal is not a right it is a privilege. Sick vick lost that privilege when he beat, shot and hanged those poor dogs. NOW I am finding out your dirty dealings with the BLM. Richard Berman is as anybody in the world of animal rights knows is the enemy and the spin doctor (lobbyist) for trying to make all the animal rights groups look bad. What you are doing with the horses only helps his cause because YOU ARE MAKING YOURSELF look bad. How dare you use vivisection on our horses. I guess in my mind that now makes you the enemy. I’m not understanding why the push for PZP? We have too few on the range. The BLM needs to up the ALM’s.